To say that this couple is hardworking and generous is an understatement! Anyone who has met these two know that they are the type of people who would give you the shirt off their back AND then take you to the store and buy you a new one. They have been fortunate to help countless citizens in our community throughout their many years of public service and have been blessed with the friendships and love of so many. 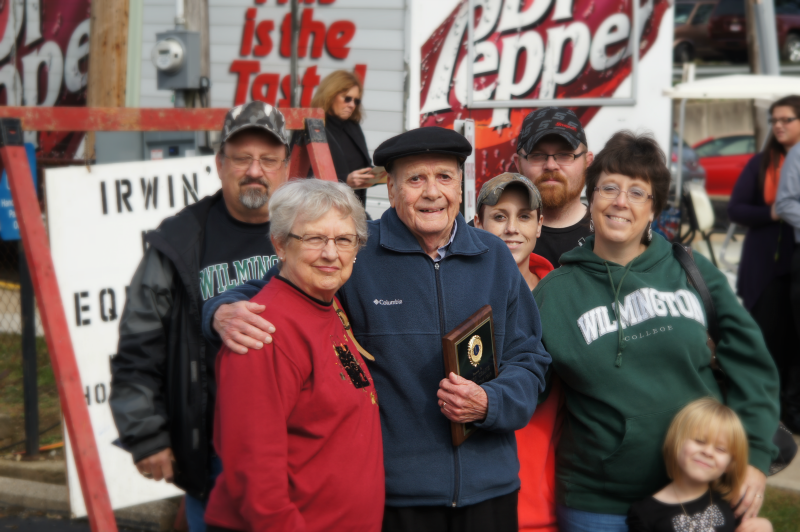 These individuals are the owners and operators of Waynesville's oldest family business. Their business was opened in 1958 by his parents, Murray and Billie. They have donated food for Waynesville High School's annual Jazz Dinner and Corwin's Annual tractor show. And yes, the business name is Davidson Meat Processing. In addition to their family business, Pat and Cheryl have also volunteered on Wayne Township's Fire Department. Pat served as a firefighter for 22 years and Cheryl served as an EMT for 31 years, each earning a "Member of the Year" award during their time of service.Pat has served as a Wayne Township trustee for the past 20 years and has also served as President of the Miami Cemetery board. He is a member of the Sons of the American Legion and is a Mason. Cheryl has served as the Mayor of Corwin for the past 10 years. Pat and Cheryl are both Waynesville alumni and proud of it. Lions club is very appreciate for ALL that they do for our organization, as well. In fact, Pat's father Murray was a charter member of Lions Club. 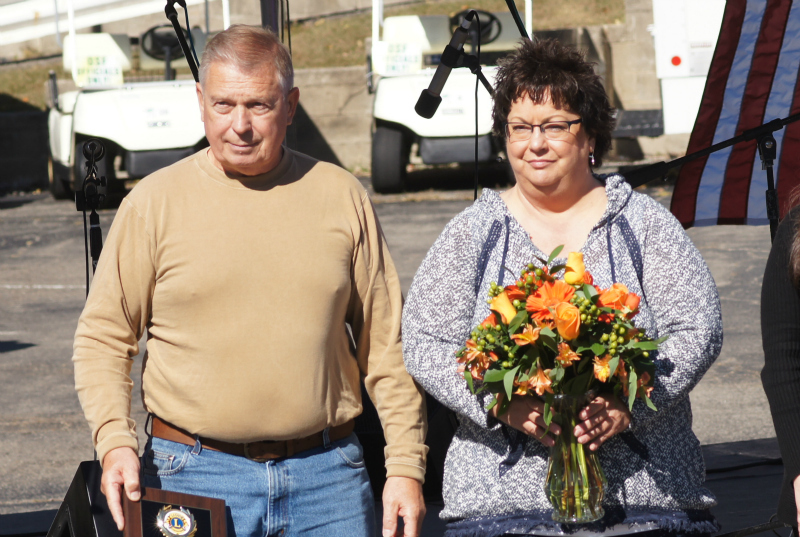 It is with great honor that we present the 2015 Waynesville Citizen of the Year award to Pat and Cheryl Davidson. Each year, the Waynesville Lions club takes great pride in choosing an outstanding member of the Waynesville community for the citizen of the year award. It’s never an easy decision, and occasionally as we look back we find that somehow a few deserving individuals seemed to have been missed, and this is the case this year. This gentleman was very active in serving the Waynesville community, at the Waynesville National Bank for over 20 years, he was the second president of the Waynesville Lions club in 1959, and a member of the Masonic Lodge in Waynesville. He served as a police officer for the Village of Waynesville and for the City of Lebanon, and as a deputy for the Warren County Sherriff’s office. Jim was a firefighter and EMT on the Wayne Township Fire Department for over 25 years. He also served as a Wayne Township Trustee, and served 2 terms as Mayor of the Village of Waynesville. Jim also wrote a very interesting article titled “The Wheels of Waynesville”, which is included in the book “Waynesville’s First 200 Years” (you can find the book at the Mary L. Cook Library). Better late than never, It is our great honor to present this Citizen of the Year award to this long time dedicated member of the Waynesville community, Mr. Jim Crane. 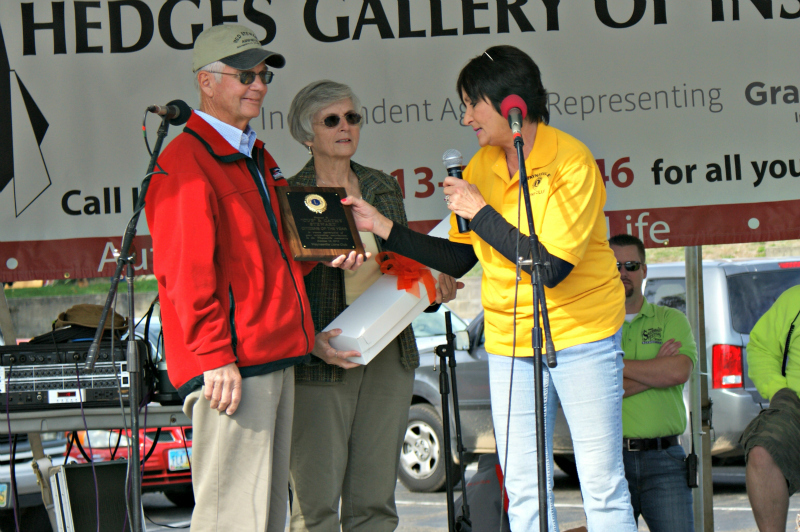 Lion Bill Jones has a long and distinguished history of serving the community of Waynesville, Ohio. For many years, his strong dedication to the principles of our club has allowed us to provide assistance and touch the lives of countless individuals and families. Born August 18, 1941 in Wilder, Tennessee and raised in Dayton, Ohio, Bill graduated from Springboro High School in 1959. That same year, he married his beautiful and lovely high school sweetheart, Sandi Sortman. They were soon blessed with four wonderful children – Beth, Brian, Michael and Penny. Or as Sandi has been known to say, Eenie, Meenie, Mynie and No More! Bill and Sandi are also the proud grandparents of ten grandchildren and three great-grandchildren. Bill and Sandi moved the family to Waynesville in 1972. They both worked hard to raise and support their family. Bill first worked for his father at their family owned service station, then at NCR, and eventually secured a job with Armco Steel, now known as AK Steel. Bill worked for AK Steel for 30 years, securing numerous promotions during his tenure, and retiring in 2005. Never one to sit around and do nothing, Bill worked part time at Ellis Super Value after retirement. Understanding the many benefits of raising a family in our friendly small town, Bill knew the importance of helping others and giving back to the community. He found a way to achieve this by serving as coach for the high school girls basketball team, coach for the high school chess club, and joining the Waynesville Lions Club in 1978, sponsored by fellow Lion Ed Andres. His dedicated service to the Lions is exemplified by serving as club President five times and club Treasurer three times. He spearheaded the Annual Rose Sale for many years. Legend has it that Bill sold more roses each year than all other club members combined. He also was in charge of many years of the Fly-In at Red Stewart Airport. Needing volunteers to help sell our mushrooms and cheese sticks at the local festivals, Bill would easily handle manning an entire day with the just the help of his family. 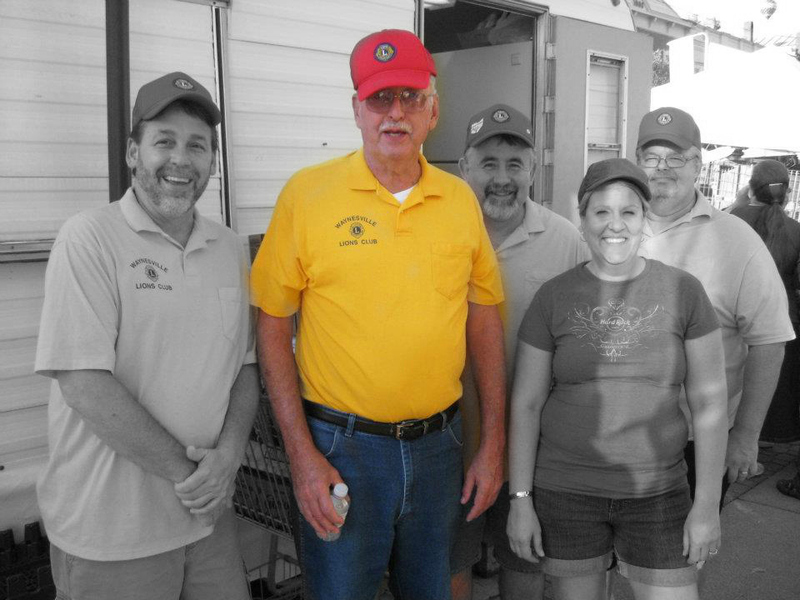 There is no better example of Bill’s commitment to family and community than the Waynesville Lions Club itself. Bill’s son Brian, nephews Rusty and Patrick, daughter-in-law Pauline and sons-in-law Dirk and Darryl are all members of the club. Bill enjoyed traveling and spending time with family and friends. And, as most of our wallets and pocketbooks know, he had a knack for beating us at our favorite card games. To say Bill was loved by many is an understatement. He was a gentle giant, always there to greet you with a smile and a kind word. It is truly our honor, our privilege and our joy to present the 2013 Waynesville Citizen of the Year award to the family of our dear friend, Bill Jones. Emerson (Cub) Stewart II and his wife Cathy, own and operate Red Stewart Airfield. The airfield was started in 1946 by Cub's parents "Red" and Irene Stewart. Cub grew up at the airfield and at a very young age he was intrigued by flying and the mechanics of flying. He went on to earn his aviation mechanics license at Parks College in Missouri and to serve in the Ohio National Guard as a flight mechanic. During these years, he continued to fly, turn wrenches at Red Stewart Airfield, and earn his professional pilot rating which he uses to fly corporate aircraft. Cub met Cathy, his wife of 44 years, here in Waynesville; they are both graduates of Waynesville High School. Cathy is originally from Indiana and moved to Ohio with her family as a teenager. While Cub and Cathy were dating they re-built the first of many airplanes that they worked on together. Soon after they were married they started an aircraft maintenance and restoration business. Throughout these years Cathy earned her pilot's license, her aircraft mechanic's license, and has managed the day-to-day workings of the airport. The Stewarts raised their two children, Sara and Emerson III, around the airport and they now both work there as well. Cub and Cathy are proud grandparents of Ryan, Audrey, and Ace, who spend a lot of fun days at the airport with their family. In 1996 they began running the flight school that was established by Red and Irene in 1946. With fourteen employees consisting of mechanics, flight instructors, and ground personnel, Red Stewart Airfield continues to maintain aircraft, provide aircraft hangers, and superior flight instruction - an average of 15 people per year get their pilot's license from Waynesville's Red Stewart Airfield. Over the years many people have trained at Waynesville an moved on to paying jobs flying for the military, for corporations, for cargo haulers, and for airlines...and of course as general aviation pilots and mechanics. Throught the years a variety of activities have taken place there which benefit many local people and organizations. Every year the stewarts host a Labor Day weekend Air Show and Fly-In that is free and open to the public. The airfield has also hosted activities involving the Civil Air Patrol, Experimental Aircraft Association, Young Eagles, and the Waynesville Girl Scouts and Boy Scouts organizations. Also, many come to Waynesville airport for glider flights and airplane rides. Cub and Cathy have kept the airfield as a "public use" airfield. The airport, with it's grass runway, is known far and wide for it's uniqueness and hospitality. The good reputation of Cub and Cathy and their airfield serves as an open invitation for people from the tri-state area and even farther to come to Waynesville to not only visit Stewart Airfield but also to visit our village. 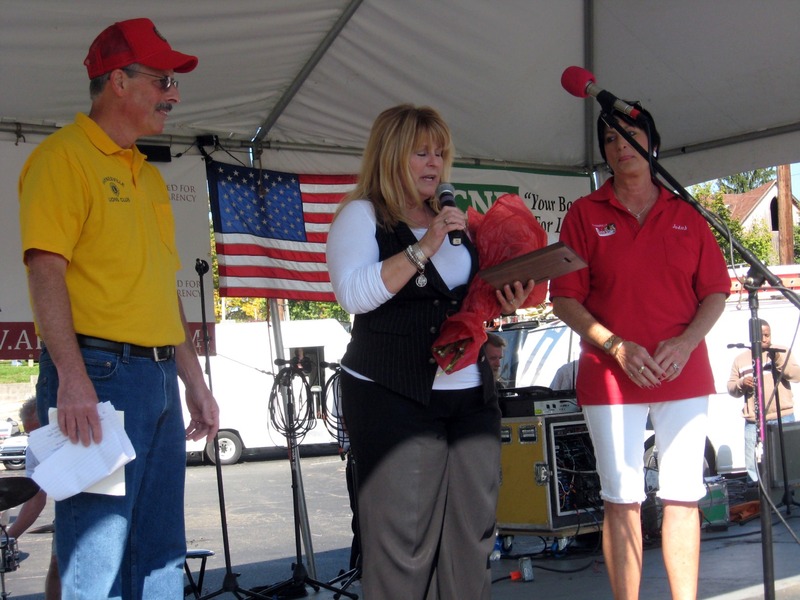 Cathy and Cub Stewart are true assets to Waynesville and we are very happy and proud to select them as the 2012 Waynesville Citizens of the Year! Citizen of the Year Award being presented to Cub and Cathy Stewart by Waynesville Lions Club President Judy Prickett. In 2011, the Waynesville Lions Club would like to honor a husband and wife from our town that most of you know. They both have been very active in our community for years. The couple we are honoring were 1974 graduates of Waynesville, High School, where they were high school sweethearts and crowned Kind and Queen at their senior prom. Dale graduated from Georgetown in Kentucky in 1978 where he earned his Bachelor's degree. Through the years he coached football and both boys and girls tennis in Waynesville, and girls tennis ay Alter. He also was Atheletic Director at Waynesville and coached his children in T-ball and basketball. Pam is very active in the community, being the chief organizer of our 4th Of July parade, working with our Christmas in the Village project, organizing the Dicken's Dinners, the Waynesville Merchants Association, and helping at the High School. The Bowmans were co-owners of Woody's Market, owned the 1776 restaurant and currently own the Hammel House restaurant here in Waynesville. Dale and Pam have shown incredible love for each other ,friends, family, and the Waynesville community. Sadly, Dale left us to be with the Lord on August 8th, 2011. He will be sorely missed but never forgotten. It is the great honor of the Waynesville Lions Club to present this award to Dale and Pam Bowman for their love, loyalty, and great dedication to the community of Waynesville. Citizen of the Year Award being presented to Pam Bowman by Lions Club President Steve Linton and Vice President Judy Prickett.